I do not recollect when and how my aversion disappeared, and now I like eating these milk products so much that I can’t seem to get enough of them. It is truly fascinating that while we grow up, how our food habits, our likes and dislikes get altered. Our eating habits are influenced by psychology of taste and eating. As per scientists it is completely possible to modify our likes and dislikes, however it would take some time and effort. As per research, as a newborn we all have innate like of sweetness and dislike for sour and bitter taste and other choices that we make in our life are from the preferences that we learn along. I found a very interesting article explaining the change in food choices of an individual. As per the article, our food preferences are shaped by what we have eaten up until the age of two, after which we become neophobic i.e. we are averse of trying anything new. So if we have never been exposed to any specific taste until this age, we will naturally shy away from that taste. This is where; most of the parents make a mistake. They typically stop feeding their child of that particular food, and in turn kid’s aversion would grow stronger. (You can read this interesting article here). 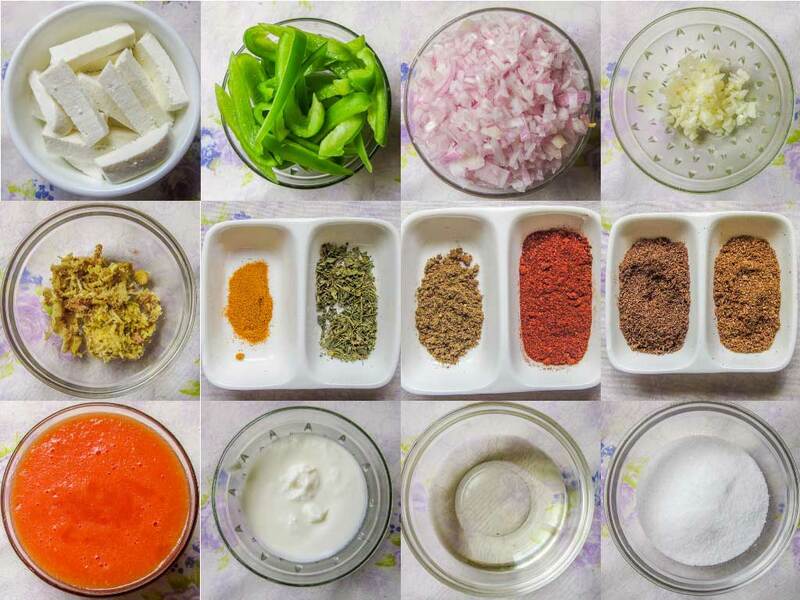 Coming back to my story, my liking for paneer (cottage cheese) has grown so much that I always make some paneer preparations in my weekly menu. In vegetarian food, paneer is a rich source of protein and low on saturated fats. However you must be careful which milk is used for making paneer. If you choose full cream milk, paneer will not be as healthy as the one made from low cream milk. Paneer is one versatile ingredient in Indian cooking and its versatility can be compared with potato. We can make use of Paneer in appetizers in Tandoor paneer, paneer tikka, paneer roll and many more. It can be used to make stuffed paneer Paratha, an Indian flat bread preparation stuffed with paneer. It can also be combined with rice and peas to make a very delicious rice preparation Peas Paneer Pulao. Paneer can also be combined with Indian spices to make some very delicious and delectable gravy in Indian cuisine. 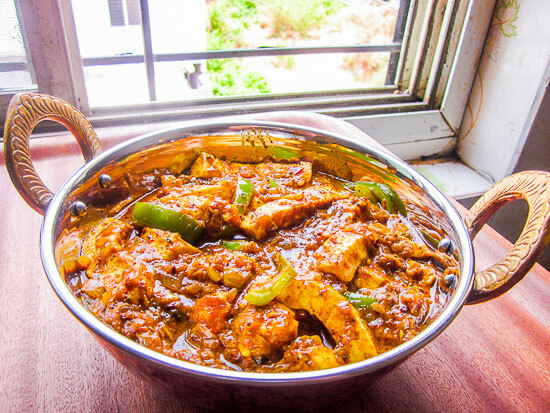 Kadhai paneer is my favorite dish that is traditionally made in Kadhai. Kadhai is thick, circular cooking pot which is similar to wok and is made up of cast iron but nowadays it is available in steel, copper and non-stick variant. However, I am sharing a microwave adaptation of this recipe which is perfectly suitable for morning rush hours. This recipe is prepared by combining Paneer cut in thick strips, with capsicum, chopped onions and tomato puree. 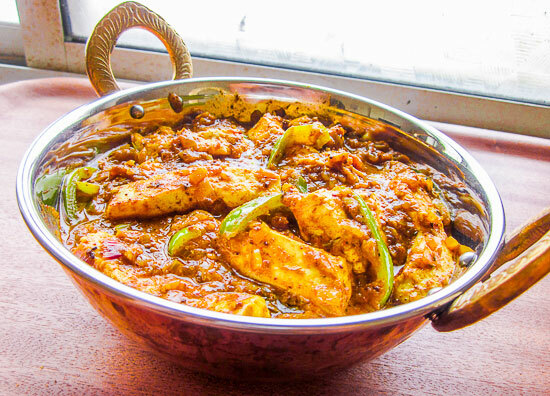 Powdered Indian spices are thrown in to enhance the taste of this dish. Finally some cream is added to balance the tangy flavor of tomatoes. Make this recipe in your kitchen and share your feedback about this recipe in the comment section below. Take 2 tbsp oil in a Microwave safe bowl.Add ginger, garlic to the bowl and mix them well. Microwave them for 1 minute. Add chopped onions and microwave for another 1 min. After 1 minute, add all powdered dry spices (tumeric powder,dried fenugreek leaves, cumin powder, coriander powder,red chili powder, garam masala powder) to the bowl and mix them well. You may choose to add 1-2 tbsp oil if masala seems too dry. a) Select Micro mode b) Power level: 900W c) Dial timer: 1 minute d) Press start. 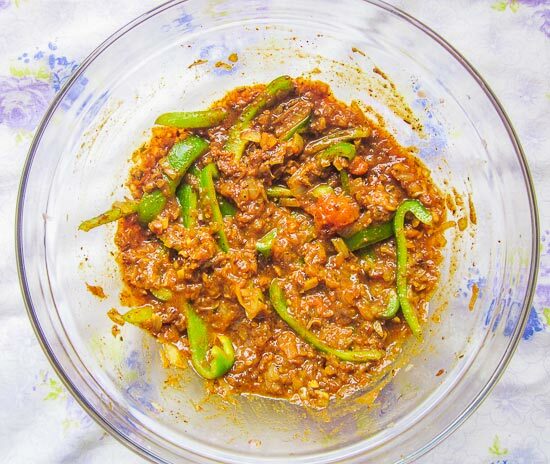 After masala gets roasted, add tomato puree, capsicum and mix them well. Microwave for 2 minutes. a) Select Micro mode b) Power level: 900W c) Dial timer: 2 minute d) Press start. After 2 minutes, add fresh cream and salt as per taste and mix them well. Now add paneer and using a spoon gently toss it around so that paneer strips are nicely coated with masala. 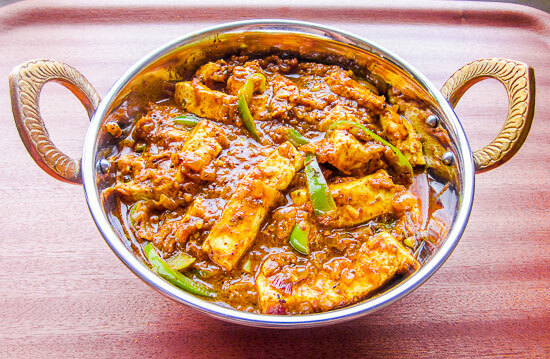 Delicious kadhai paneer in 7-8 mins. Thanks a lot Siddharth for stopping by and for such a wonderful feedback 🙂 It means a lot to us! Happy reading, enjoy cooking!